For some people, one moon just isn't good enough. The quest to find a second Moon has roped in Jules Verne, the man who discovered Pluto, and a pair of deluded astronomers. But here's the thing: there really is a second moon... sort of. In 1846, the director of the Toulouse Observatory in southwestern France announced the discovery of a second moon. A 36-year-old astronomer named Frédéric Petit, the director claimed that two astronomers at his observatory and another at Artenac Observatory had spotted the second moon on March 21, 1846. He had calculated the moon orbited Earth every 2 hours, 44 minutes, and 59 seconds, with its distance from Earth varying wildly from 2,220 miles to just 7.1 miles. That last bit was dubious back then, and it's completely ridiculous now — 7.1 miles is roughly how high commercial airliners fly. Most astronomers simply dismissed these claims entirely, and a quick survey of Petit's career shows there wasn't much point in giving much credence to his extraordinary claims. Petit had had an undistinguished academic career, and his appointment as director of the newly built Toulouse Observatory at just 28 years old was largely dismissed as an act of favoritism by his mentor, the influential astronomer François Arago. If there was one thing Petit excelled at, it was the use of mathematics and calculation to solve astronomical problems. The issue, it seems, was that Petit didn't care that much about actual data, so certain was he that his calculating prowess could explain all reality. For instance, his 1860 observation of a solar eclipse happened in such poor weather conditions that any other astronomer would have called it a failure. Petit simply made his best guess at the observation data, and then trusted in his mathematical acumen to produce truth. He concluded his career by trying to prove the Pyrenees were hollow, simply because his astronomical calculations again demanded he believe in a staggeringly wrong observation. Petit never completely abandoned his contention that Earth had two moons. In 1861, fifteen years after he made his initial claims, he published another paper claiming that there must indeed be a second moon, because of certain orbital irregularities he had noticed in the first moon (or, as every other astronomer called it, "the Moon"). Again, he was dismissed by the rest of the scientific community, but one person took note of it: a young French writer named Jules Verne. "Yes, my friend, [Earth] has two moons, although it is usually believed to have only one. But this second moon is so small and its velocity is so great that the inhabitants of Earth cannot see it. It was by noticing disturbances that a French astronomer, Monsieur Petit, could determine the existence of this second moon and calculated its orbit. According to him a complete revolution around the Earth takes three hours and twenty minutes... if, like us, [astronomers] had met it they could no longer doubt it...But this gives us a means of determining our position in space...its distance is known and we were, therefore, 7480 km above the surface of the globe where we met it." It's hard to say how much Verne actually believed in Petit's ideas - honestly, it seems just as likely that Verne needed something to alter the capsule's trajectory, and so this was just a narrative convenience. Whatever Verne's motivations, the idea proved irresistible to amateur astronomers all around the world, who figured discovering this second moon was a surefire way into the history books. Thanks to Jules Verne, Petit had achieved a measure of redemption for his ideas, although he sadly didn't live to enjoy his idea's new-found popularity. The most famous claimant after Petit was probably Dr. Georg Waltemath, an otherwise completely obscure man from Hamburg who was referred to as a scientist, although it's unclear what his credentials actually were. In the late 1890s, Waltemath didn't just claim Earth had two moons. Instead, he claimed there was an entire system of lots of little moons, all orbiting the Earth and all otherwise undetected, which he had spotted because of how they affected the Moon's orbit. "The second moon of the Earth has been actually observed passing the sun on the 16th of February, 1897, at Munich, by Mr. C. Waller, art painter, and a friend, and also on the 4th of February, 1898, at Greioswald, by Post-Director Fregler and eleven other persons. Besides this, on the 21st of January, 1898, at Berlin, it was observed by the officials of the imperial postoffice [sic] at five o'clock in the morning shining at full light." Dr. Georg Waltemath, of Hamburg, is insatiable of moons. 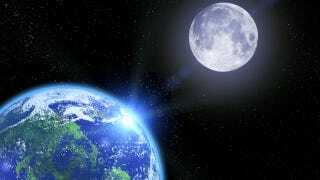 He has sent us, under the date of July 20th, an announcement of a third moon for earth. This moon is said to be 427,250 km. distant and is 746 km. in diameter. It is nearer than Dr. Waltemath's other moon, and is a 'wahrhafter Wetter-und Magnet-Mond.' Perhaps it is also the moon presiding over lunacy. By the standards of Science, that last bit was about as harsh a burn as they ever likely gave. Waltemath had his successors — the most active contemporary claimant is probably an American named John Bagby, who since the 1960s has claimed Earth has at least ten tiny moons, which he believes to be the remnants of a larger body that came apart in December 1955. As you might imagine, this has not won too much acceptance among astronomers. All this isn't meant to suggest that the idea of a second moon is inherently ludicrous. While the relatively large satellites described by Frédéric Petit and Georg Waltemath were pretty clearly ludicrous, that didn't rule out the possibility of one or more very small moons that had until now escaped detection. This possibility was seriously explored in the 1950s, as the United States prepared to launch artificial satellites into orbit, and officials wanted to make sure they wouldn't spend half their time bouncing radio signals off of unknown moons. In 1953, the Army Office of Ordnance Research asked Clyde Tombaugh, the renowned astronomer who had discovered Pluto in 1930, to undertake a survey of all the space between Earth and the Moon. Considering Tombaugh had discovered Pluto through the painstaking search of photographic plates, he seemed the ideal choice to undertake a comprehensive search of the area around Earth. Six years later, his work completed, Tombaugh said he was pretty much certain Earth had no additional moons, though he conceded an object smaller than a foot across would have been too small to see in his telescopes. While the end result of Tombaugh's work was fairly mundane and expected, his work did arouse some rather more sensationalist attention. In 1954, the Los Angeles Times claimed any tiny moons discovered by Tombaugh could be used as "a steppingstone to the stars" and, rather less poetically, as a space-based missile platform in times of war. Amusingly, while these were seen as completely legitimate possibilities, the article ridicules "space-ships", placing them in dismissive quotation marks and noting "if they ever materialize [they] probably never would touch earth." All in all, not the most impressive set of predictions the Los Angeles Times ever made. As with just about everything else space-related in the 1950s, Tombaugh's moon search got caught up with the flying saucer craze. UFO researcher Donald Keyhoe claimed that his Pentagon sources had told him near-Earth objects had indeed been discovered, and in August 1954 erroneous reports broke that two new natural satellites had been found just 400 and 600 miles away. Though Tombaugh was himself interested in UFOs — he's probably the most important astronomer to have claimed a UFO encounter — he had nothing to do with these rather confusing rumors of, well, something having been discovered, and he repeatedly made it clear no new satellites, natural or otherwise, had been found. While we can safely rule out the existence of any permanent second moons for Earth, there are about eight thousand Near-Earth objects (NEOs), which are all the asteroids, comets, and meteors that orbit the Sun in close proximity to our planet. Some of these can occasionally drift into what appears to be a temporary orbit around Earth instead of the Sun. However, these still aren't real satellites, in that they don't really orbit the Earth — instead, they are locked in a 1:1 resonance with the Earth while still orbiting the Sun. There's only one known natural object other than the Moon that actually does seem to orbit the Earth, albeit briefly. As such, the strongest claim for being a full-blown second moon probably belongs to 2006 RH120, an asteroid only about ten to twenty feet across, which entered temporary orbit a few years back. After spending eleven months in orbit around Earth, it moved away once again and isn't due back until around 2028. And that tiny, drifting rock has the strongest claim as Earth's second moon. 2006 RH120 may be representative of a new breed of temporary moons. Astronomers Mikael Granvik, Jeremie Vaubaillon and Robert Jedicke have just published a paper explaining that Earth is most likely pulling in very small temporary moons all the time, most about the size of 2006 RH120. They say that, on average, we can expect there to be at least one temporary moon around Earth at any given time, although these don't last long, with about 1% actually ending up crashing down onto the Earth itself. There's also 2002 AA29, which is about 150 to 350 feet across. It's also in a 1:1 resonance with Earth, and it's considered one of the most attractive options for future space explorations. Most of the time, it simply shares Earth's orbit, but every so often its movements line up with those of Earth so that it becomes a quasi-satellite, moving in an apparent orbit of Earth for 45 years. We might well consider that the stuff of a second moon, but it's a ways off - this last happened in 520 CE, and calculations show it will happen again around 2600, 3750, and 6400. 2002 AA29 is one of five objects known as quasi-satellites, along with 2003 YN107, 2004 GU9, 2010 SO16, and one other we'll get to in a moment. There's also the rather strange case of J002E3, which was originally thought to be an asteroid in orbit around the Earth before astronomers realized what it really was: an old piece of the Saturn-V rocket used in the Apollo 12 mission, which we had simply lost track of. The most famous latter-day claimant for the title of second moon is probably Cruithne, which orbits the Sun in a 1:1 resonance with Earth. It's probably the largest quasi-satellite, at just over three miles in diameter, although its closest approach to Earth is a good thirty times the distance between Earth and the Moon. Because of the arrangement of our respective orbits, Cruithne has what's known as a horseshoe orbit relative to Earth. To us, Cruithne appears to first move away from us, then reverse direction and trace a giant arc back towards us. That last part looks like a horseshoe, and its motion relative to Earth resembles a giant kidney bean. However, Earth's gravity currently causes to take 364 days to orbit the Sun, so it is moving slightly faster than Earth and drifting slowly drifting away from us. Eventually, Cruithne will loop all the way around and appear to be catching up to Earth as opposed to moving away, and at this point gravitational energy will actually make Cruithne take slightly more than an Earth year to orbit the Sun. This whole process takes 770 years to complete. This all adds up to a remarkably stable arrangement for Earth and Cruithne. While the object can't really be called a second moon, it is quite possibly our most long-term orbital companion other than the Moon itself. Cruithne has been around Earth for at least thousands of years, and there's no reason to think it will be leaving anytime soon. It likely won't last the billions of years the Moon has, but as second moons go, Cruithne is about as impressive as it gets... even if, yes, it really isn't a second moon at all. "Did Earth Once Have Two Moons?" Did Earth once have two Moons? Top image by zhanna ocheret, via Shutterstock.